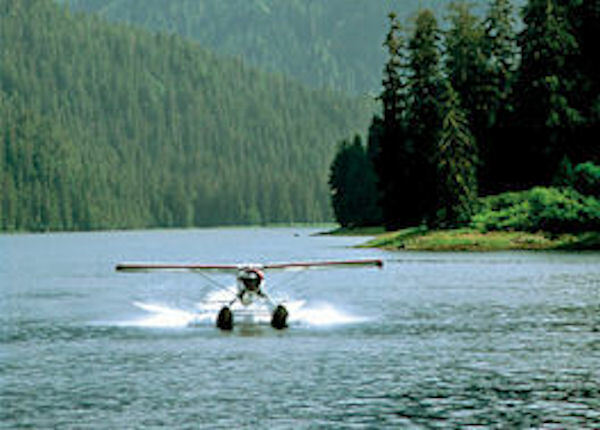 Your guided journey unfolds as you fly over Tongass National Forest on your specially equipped aircraft, where you'll view and experience a landscape slowly crafted by nature over tens of thousands of years. Sheer granite cliffs, plunging 1,000-foot waterfalls, and the Misty Fjords National Monument, home to some of the most dramatic scenery in Alaska, make this a memorable experience for all. The Tongass National Forest has been set aside as a fully protected wilderness area encompassing more than 2 million acres of dramatic granite cliffs and lush vegetation, and is home to hosts of land and marine animals. During your tour, you will land on a remote mountain lake or saltwater fjord where you may absorb the silence, serenity and monumental beauty that surrounds you. A descriptive route guide helps identify landmarks and scenic highlights and serves as a memento of the trip.